“BRTN” is a periodic feature on JH.com, in which I write reviews/appreciations of books that are not exactly current. Today’s entry is, for me, rather timely; my last was on a John Updike memoir from 1989. The trouble is, time waits for no man — and neither does Chuck Wendig. The second Death Star is destroyed. The Emperor and his powerful enforcer, Darth Vader, are rumoured to be dead. The Galactic Empire is in chaos….Optimism and fear reign side by side. 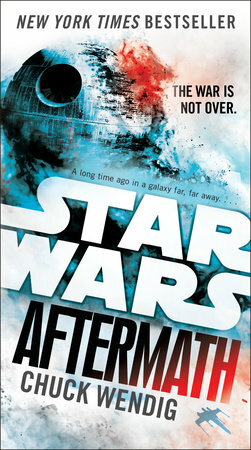 This is how Star Wars: Aftermath by Chuck Wendig begins. If you need more background information than that, then you may not have been living in this hemisphere during the last number of decades, and maybe this 2015 novel isn’t for you. Wendig – about whom more later, but let’s just say now that he is phenomenally productive, and a review like this is at least three novels behind – adds full-length sequels in each of the next two years. The seemingly unbreakable Star Wars Rule of Threes continues its reign. Together, the trilogy forms part of a “new canon” of official SW material beyond the films themselves. Aftermath and its children form a bridge between the events of films over 30 years apart: 1983’s Return of the Jedi, and the grizzled-Han and dowager-Leia reunion in The Force Awakens (2015). (Yes, I know, other things happened, too. Luke, for example. And ‘droids. And light-saber battles.) I’m not an SW junkie, and don’t go near fan-sites or extended universes or fundamentalist skirmishes over what is and should be in the Star Wars canon. But like this novel, I do. It is fast, inventive, breathless and constantly in the present tense, a Wendig trademark. Unknown characters appear in rapid succession, but with references to more or less familiar faces and names from the movies (Admiral Akbar, who does not age at all; C3P0, with upgrades). We know where we are, even when jetting into new worlds. On Coruscant, in one of Wendig’s several “Interludes” — short set-pieces that add context and flavour, and offer a place for him to stow away extra ideas — emboldened former Imperial citizens pull down a statue of Palpatine; see Hussein, Saddam, formerly of Iraq. Imperial Admiral Rae (she’s a woman!) Sloane has a toady and untrustworthy adjutant typecast to remind us of the unfortunate official Force-choked by Vader in the original Star Wars film. Although Wendig takes bitter criticism (surprise!) from many of the Star Wars faithful, Aftermath is an agreeable confection that blends the familiar with the rather wonderfully invented bridgework, with only the occasional bump. The Empire is going, not gone. Akiva, as tropical a planet as Luke Skywalker’s Tattooine was dry, is now again crime-ridden, with ex-Imperials and ganglords competing for the spoils.